September 22-25 Happy Birthday Mr. Faulkner Festival! One month from today, new and established writers join dedicated readers in a unique birthday celebration, September 22-25, 2018! The Pirate’s Alley Faulkner Society will kick off its annual salute to all great writers on SATURDAY, September 22 with bestselling non-fiction author Walter Isaacson introducing our humanities theme, “Place as Muse for Literature,” emphasizing as an overture to the Tricentennial celebration, “New Orleans as Muse for Literature.” The event, a joint venture with the State Museum, will take place at the Cabildo. This will be followed by a Welcome Party for out of town writers, competition judges, and underwriters at the residence of Anne and Ron Pincus, 724 Barracks Street, from 5:30 to 7:00. The evening will be free for out of town guests to enjoy a night on the town, dining out and listening to music. SUNDAY will feature advice sessions and manuscript critiques by editors and agents through 2 p. m. in the Provincial Hotel’s meeting room. On Sunday evening The Society and its guests will be looking at the world through the rose-tinted lenses of literature at the gala annual meeting and fundraiser, Faulkner for All, which has a 2018 theme of “Everything’s coming up roses.” The event will take place at the historic Ursuline Convent Complex, with the awards program to begin in the Convent’s attached St. Mary’s Chapel. 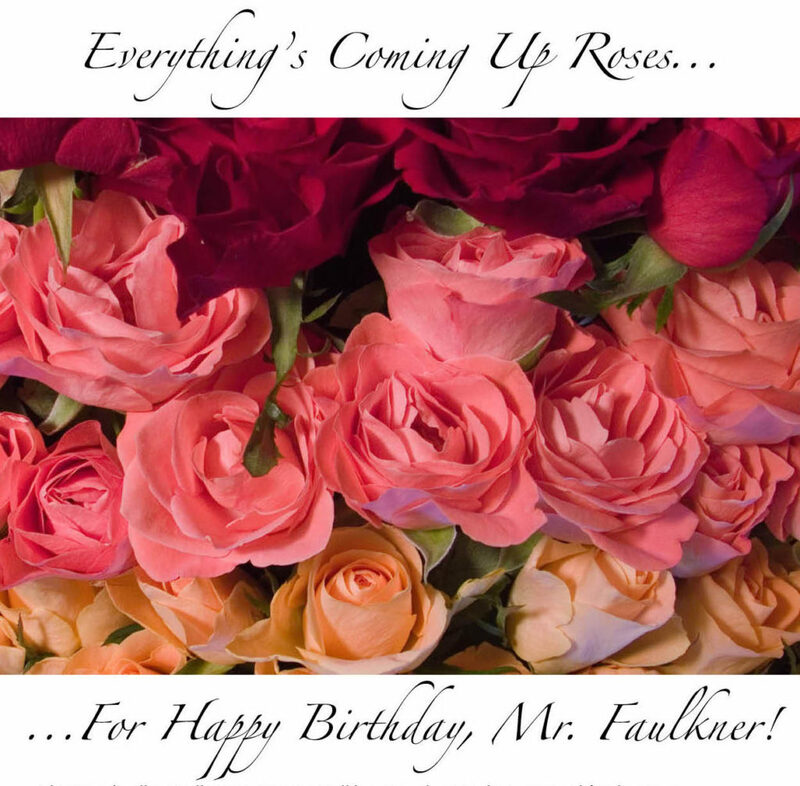 The focus Faulkner work this year is his southern Gothic short story, A Rose for Emily, which includes noir humor as well as traditional horror elements. The distinguished author, poet, and playwright John Biguenet, emcee for the evening, will discuss the rose as a symbol in literature through the ages and Faulkner’s story as a lead in to a staged reading from the story by professional actors. The fundraiser following will take place in the Convent Garden, which is planted with antique roses. The rose theme will be carried out in décor, cuisine, signature drinks, and even in the music for the evening. Patron gifts for the event are rose-tinted sunglasses. Noted New Orleans artist Frederick Guess is creating this year’s Faulkner painting for auction to benefit the Society and it will depict a young Faulkner with a rose for Emily. Guests of Honor will include Faulkner scholars Thomas & Judith Bonner who have re-published the famous book Sherwood Anderson and Other Famous Creoles created by Faulkner and his New Orleans landlord and pal, the artist William Spratling, to poke fun at their friends in the bohemian literary community of New Orleans in the 1920s. The book had gone out of print and the Bonners have re-issued it in a delightful new edition which also contains their editorial commentaries. MONDAY, September 24, literary discussions will be at the New Orleans Jazz Museum, which occupies the historic Old Mint, 500 Esplanade Avenue. The day will begin at 9:30 with a tour of the new exhibits of the Jazz Museum. The first discussion, which begins at 10 a. m. in the museum’s performance hall, will be “Music and Music Places as Muse for Literature.” There will be five discussion segments, including presentation of papers with a break mid-day for a catered lunch. Concurrently, advice and critique sessions will be held in the Green Room. On Monday evening, competition winners, judges, and out-of-town writers will be guests for tea and cocktails at Faulkner House, 624 Pirate’s Alley, at 6 p. m. Out of town guests are on their own for the evening to enjoy New Orleans, celebrating its 300th anniversary this year! TUESDAY, September 25, literary discussions will take place from 10 a. m. to 1 p. m. at The historic Presbytere and will feature this year’s competition judges, authors Ladee Hubbard, Zachary Lazar, Moira Crone, John Biguenet, M. O. Walsh, Rodger Kamenetz, Peter Cooley, and Laura Lane McNeal. They will appear with their winners. Following these sessions, there will be a champagne luncheon in the private Green Room upstairs at Tableau, with toasts to Mr. Faulkner by guests who will be called on at random to recite their favorite Faulkner quote in 30 seconds or less. Invited literary agents and editors include Katherine Fausett of Curtis Brown, Ltd., Jeff Kleinman of Folio Literary Management, and Brenda Copeland, with others to be announced. The literary marketing guru Shari Stauch will be joining them in advice and critique sessions for writers. The festival will adjourn at the conclusion of the luncheon. The Society will pay transportation up to $500 and hotel accommodations at the lovely boutique hotel in the French Quarter, the Provincial for the winner. Runners-up will be our guests for all of the events but must pay their own travel and hotel expenses. Others on the short list who wish to attend will received a discount of 50% on the writers package for the occasion. The package includes manuscript critiques. Literary agent Katherine Fausset will be critiquing winners and runners-up of all categories. Other agents, editors are to be announced. 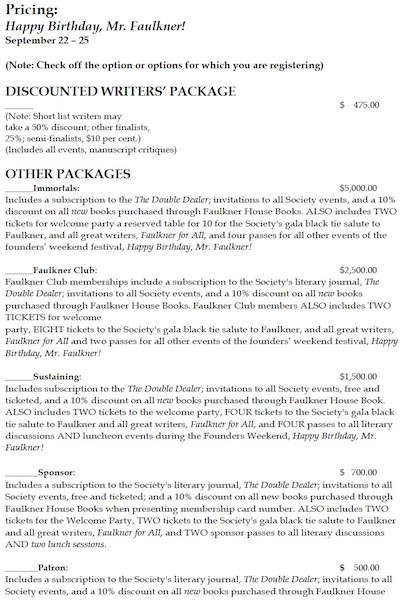 Other finalists can enjoy a 25% discount off the $475 writer package price; semi-finalists are offered a 10% discount. Writers should plan to arrive on Saturday, September 22 by mid-day to attend the opening session, including the keynote address by Walter Isaacson. there are many B&B rooms available in Marigny, just across Esplanade Avenue, downriver from the French Quarter. business attire recommended. No shorts for events, pleas. rose-printed items for both men and women readily available including socks, ties, bow ties, shirts for men, as well as jackets and shirts in rose colors; dresses, scarves, silk roses on combs for the hair, blouses, tights, and shoes for women, as well as garments in rose colors. So, help us bring our Sunday night rose garden into full bloom. Please don’t hesitate to e-mail faulkhouse@aol.com with your questions.